11:00 Check in at the International Departure Terminal – OR Tambo. 13:45 Depart on Singapore Airlines flight SQ479. Meals on board. 06:10 Arrive in Singapore. Remain in transit. Change flights. 09:20 Depart on flight SQ176 from Singapore. 11:40 Arrive in Hanoi, Vietnam. Clear passport and customs formalities. Your private English speaking tour guide and driver are ready to welcome you to Vietnam. Transfer to Hanoi capital city, check in at the May De Ville Hotel in De Luxe rooms. Located in the heart of Hanoi Old Quarter just a block away from the Hoan Kiem Lake, within walking distance of the central business district and major local attractions such as Ngoc Son Temple, Thang Long Water Puppet Theatre and Dong Xuan – Hanoi’s largest market, Bach Ma Temple Hanoi Opera House… makes shopping and exploring the city’s sights enjoyable and convenient. Afternoon at leisure to rest after the long flight. 08:30 Pick up at your hotel and transfer to visit Ho Chi Minh complex with first stop at Ho Chi Minh Mausoleum – a large memorial to the national hero – President Ho Chi Minh who led the country to independence and reunification. The Mausoleum is located at Ba Dinh Square where Ho Chi Minh President read the Declaration of Independence on 02nd Sep 1945 establishing the Democratic Republic of Vietnam. Then take a short walk to the Presidential Palace & House on Stilt. Near from Ho Chi Minh complex, One Pillar Pagoda – symbol of Vietnam with unique architecture of lotus flower is a must-see destination for all Vietnam tours. Our next stop will be the Temple of Literature which is the first university in Vietnam. It was constructed in 1070, first to honor Confucius and nowadays to celebrate the doctorates and high rank scholars of Vietnam. 12:00 Take a break at a local restaurant for having lunch. 13:30 Continue your Hanoi city tour to the Museum of Ethnology offering an insight into the 54 different ethnic groups of Vietnam. It introduces Vietnamese traditional ways of life from religious events to the symbolic rituals as well as displays a variety of Vietnamese homes as full-scale replicas outside. 09:00 Transfer to the Hanoi cooking center. 09:40 Brief introduction to Vietnamese cuisine, highlighting the contents of tradition meals. 12:00 On completion of the cooking class, enjoy the meal and a chance to chat with Tracey Lister and Linh, relax in the comfort of the HCC dining area and enjoy a local beer or wine or lemon juice. Afternoon at leisure and discover other parts of Hanoi capital city. Dinner at own expense and overnight in Hanoi at your hotel. 09:00 Breakfast at your hotel. 10:00 After breakfast at hotel, our tour guide and driver will transfer you to Hanoi airport for your short flight to Danang. 12:30 Depart on Vietnam Airlines flight VN173. 13:50 Arrival in Danang. The local tour guide and driver there will pick you up and transfer to Hoian. Arrive and check in at the Like Hoian Hotel in De Luxe rooms. Rest of the day is at leisure and discover Hoian ancient town by you own. 08:15 We start the day with a welcome drink at Hai Café, 98 Nguyen Thai Hoc Street, Hoi An Ancient Town, Tel: 3863210, located 1½ km’s from your hotel – our meeting point. Bring your swimsuit and after the cooking tour has finished relax and enjoy free use of our new 20-meter swimming pool. Transfer back to your hotel. Dinner on your own arrangement and overnight. usual tourist circuits. At lunch-time you will be invited into a local home for a traditional Vietnamese meal, and learn their customs and traditions. After you have relaxed for a while under the shade of a mango tree, you will begin your return towards Hoi An, which will take about an hour. Rest of the day is at leisure and overnight in Hoi An. 08:30 Breakfast at your hotel. Free at leisure until our tour guide and driver come to hotel and transfer you to Danang airport for your flight to HCM. 11:45 Depart on Vietnam Airlines flight VN121. 13:10 Arrival Tan Son Nhat airport in Ho Chi Minh City. Your tour guide and driver in HCM will pick up and transfer you to the Sunland hotel and check in. Located in the center of Ho Chi Minh City’s vibrant business and entertainment district, the SUNLAND Hotel is luxury 3-star-hotel and one of the most beautiful hotels in the center of Ho Chi Minh City (Saigon). It is very close to Ben Thanh market, historical sites, old architectures as well as modern architectures in the city. Dinner at own arrangements and overnight in your hotel. After breakfast at hotel, enjoy a morning drive to visit the famous Cu Chi Tunnels, an underground tunnel network constructed by Vietnamese resistance fighters during the long struggle for independence where you will understand more about the Vietnam War or American War, a must-see Vietnam Tour for any tourists to learn about Vietnam past and present days. Drive back to Ho Chi Minh and enjoy lunch. In the afternoon, we have haft day city tour including the Notre Dame Cathedral and the Central Post Office built between 1877 and 1883 by renowned architect, Gustav Eiffel. Continue to Dong Khoi Street and Opera House. End of your Ho Chi Minh city tour today is at the Ben Thanh market. Market visit from 8:45am till 9:40am. Hands-on cooking class from 10am to 1pm. Cook and enjoy 3 dishes, 1 dessert, free flow local iced tea and water. 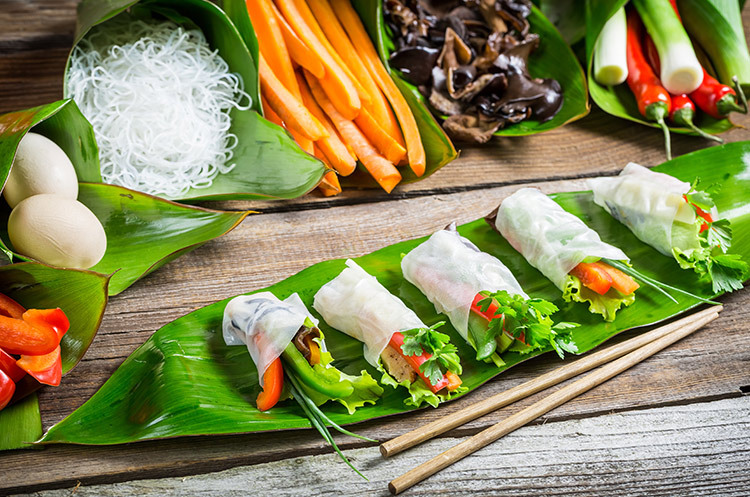 Learn the Secrets of Local Cuisine with our Vietnamese Chef! Our partnership with “Hoa Tuc” restaurant makes our cooking class unique! We follow their excellent recipes and welcome guest in the old Opium Refinery of Saigon! In a warm atmosphere, participants cook together with our Chef but everyone has their own material and ingredients for a better understanding of cooking techniques. Participants use Vietnamese kitchenware to cook and enjoy a delicious 4 courses Vietnamese meal. Of course, no MSG or “Knorr powders” are used! Bring back home a nice folder with recipes. Afternoon is at leisure and overnight at your hotel. Some leisure time for shopping and own lunch. 15:30 Collect your luggage from the hotel and depart in private coach to the airport. 16:40 Check in for your flights at the Singapore Airlines counters. 19:40 Depart on flight SQ185 from Ho Chi Minh City. Meals on board. 22:40 Arrive in Singapore. Remain in transit. Change flights. 01:25 Depart on flight SQ478. 06:10 Arrive in Johannesburg after breakfast on board.